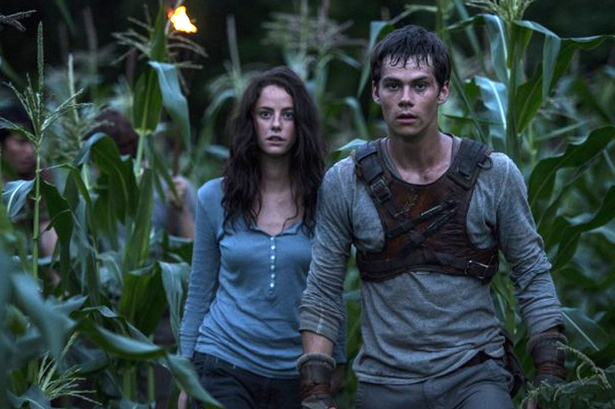 Graham Young reviews The Maze Runner, starring Dylan O'Brien and Kaya Scodelario. Surprise, surprise! Here’s another blockbuster about young people requiring a sense of resilience in a post-apocalyptic world. The latest in the recent glut of ‘young adult’ movies is based on the books by James Dashner. The action begins with a young man called Thomas (Teen Wolf star Dylan O’Brien) trapped in a lift that’s rocketing upwards. With no memory of his life before, he steps out at the top into vast green space called The Glade. “You get your name back in a day or two. It’s the one thing they let us keep,” explains Alby (Aml Ameen), the de facto leader, who emerged into this strange prison three years ago. Gargantuan walls enclose The Glade and every morning, one wall parts to reveal a maze which ‘runners’ like Minho (Ki Hong Lee) map while avoiding hideous denizens called Grievers in the vain hope of finding an exit. The runners must return before dusk when the wall closes and the maze reconfigures. Having plucked his name from the fog of his mind, Thomas forges friendships with Alby, second-in-command Newt (Thomas Brodie-Sangster) and runt of the litter Chuck (Blake Cooper), but falls foul of brutish rival Gally (Will Poulter). Out of the blue, a girl called Teresa (Kaya Scodelario) emerges from the lift. Thomas is given three rules he must obey – one of which, of course, is that he must ‘never go beyond those walls’. Watching the doors sliding together gives the film its greatest degree of suspense because nobody has ever returned. The threat of bloodshed hangs in the air but it’s only when Thomas strays into the labyrinth that the film unveils a surprisingly nasty streak, despatching the good-looking cast in a shockingly cold, clinical fashion. Debut directed by Wes Ball, The Maze Runner generally has ambitious production values, is well edited and boasts a thumping score. Think of it as Lord Of the Flies meets Alien. Young actors like British pair Will Poulter (Gally) and Kaya Scodelario (Teresa) put in rock steady performances, but after Twilight, Elysium, The Hunger Games, The Giver and Divergent, this genre already feels fully-stretched.